I had some unexpected time this week, and was able to turn out the most part of the bustle petticoat! The pattern is the sensibly designed Truly Victorian Underskirt pattern, TV201. 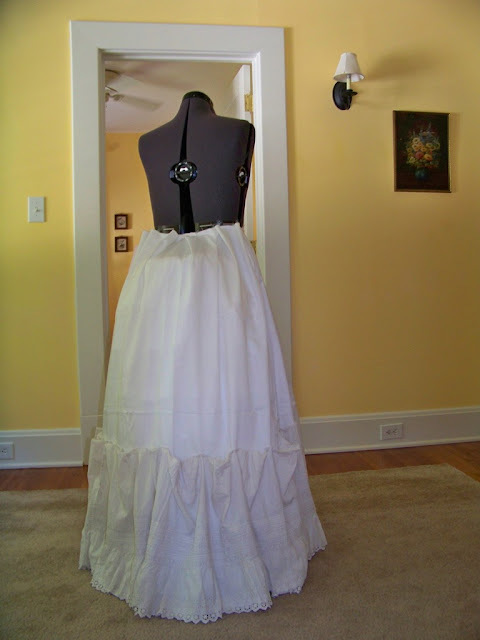 It can be used for petticoats, too. It's been easy as pie to do. All skirt seams are left raw or are pinked, the skirt hem is 1" deep and machine sewn in straight stitch. The placket is simply hemmed. 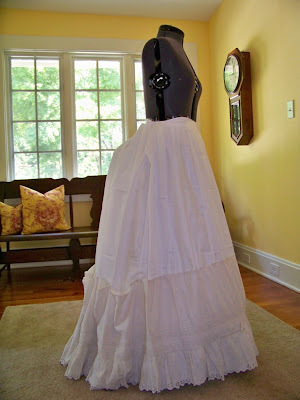 I checked Reconstruction Era Fashions, by Frances Grimble, and sure enough, the Harper's Bazar petticoat pattern therein directs the seamstress to hemming it with a narrow hem, and overlap the closure 1-2 inches. The flounce is an antique. I had a heavily damaged petticoat in my possession with a massively gathered flounce on it. Most likely 1890s or Edwardian, the embroidery nonetheless recalls that of earlier decades. Therefore, I removed the flounce, undid all the gathers, and voila, more than enough for the bustle petticoat. 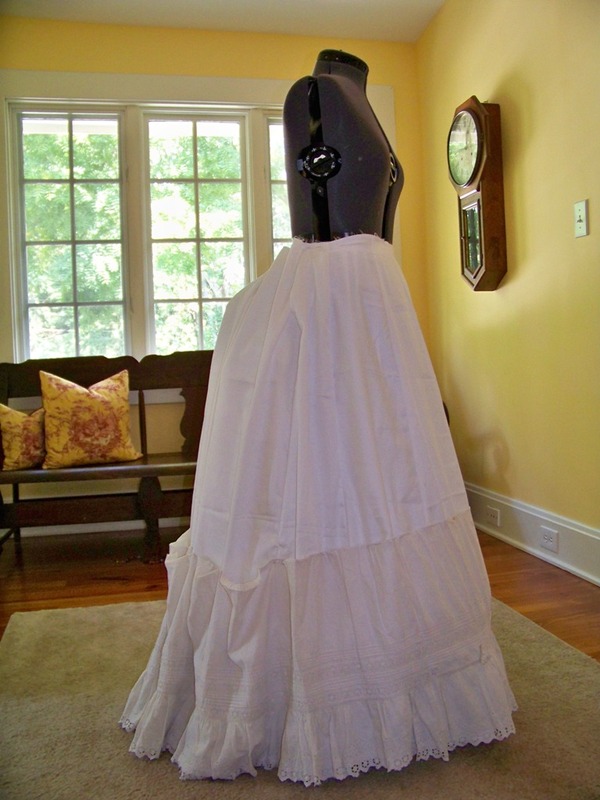 The petticoat has seen lots of use: the eyelet embroidery on the bottom had been trodden on or caught on things so often that parts are missing or torn. I will back those spots with plain muslin. Another part shows a large mend where a hole had been patched. I am making sure that the new muslin base skirt is long enough to protect the flounce. I've pinned it in place, mostly, a fiddly process since the flounce is still whole, not in a long strip. It's laid flat in front, and will be laid in tiny gathers in back. The raw top edge is turned over. It's been fun doing this project so far. See you next time! Isn't this such a fun project! I'm so glad you brought it up. Your petticoat is looking fabulous, and I can't wait to see your dress. What a great way to use an old textile, brilliant! I do love bustles, the line is irrationally pleasing to the eye don't you think? Good morning! This is indeed the most fun I've had for awhile. The fluff is just wonderful. Bustles irrationally pleasing? That's a perfect description. It's the curviness, the S-shaped sweep, that pleases me so. I have a theater costume book that says the movement of the period is perky and spirited...it just suits the exuberance of silhouette.